From Good Smile Company. New Production Run! 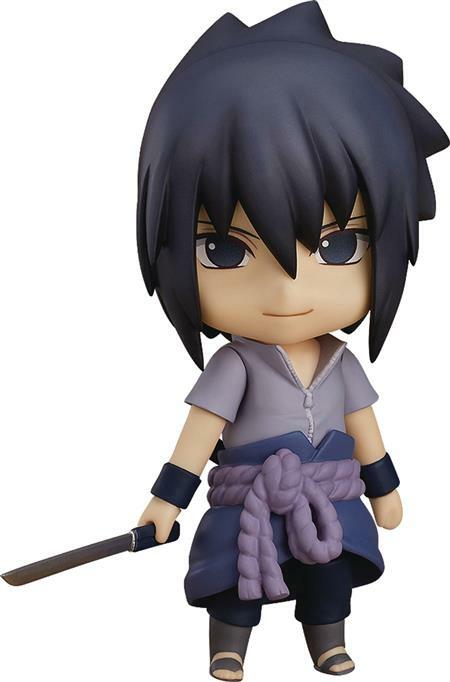 From the popular anime series Naruto Shippuden comes a Nendoroid Sasuke Uchiha! Sasuke's cool and composed appearance has been faithfully converted into Nendoroid size and he comes complete with three face plates including his standard expression, a Sharingan expression as well as a Mangekyou Sharingan expression! Sasuke comes with a selection of optional parts including his 'Chidori' ninjutsu parts and a special illustration sheet features Sasuke's Susanoo together with effect parts to complete Sasuke's impressive appearance when he fully awakened his Mangekyou Sharingan! Additionally, 'Union Sign' hand parts for Sasuke and Naruto are included allowing you to display the two of them forming the Union Sign that they were never able to complete themselves in the series.